I teach AS and A Level Geography on the Pearson Edexcel Spec 2016+ and also BTEC Business Level 3 Extended Diploma, Units 1, 4, 5, 6, 7 and 15. Over two years of work and feedback with A Level students at my college has enabled me to put together this detailed guide, (please note the preview below only shows 3 random pages selected by TES). The guide, which covers all the elements the students find tricky. From picking a topic, to how to structure their questions, to which fieldwork to undertake, how to present it, how to analyse it and how to write the final report. Feedback from students is - this makes it manageable to be completely independent and confident you are doing the right thing. Feedback from moderation and results - our wholly independent reports were outstanding examples of students exploring Geography using the skills they’ve been taught. The entire cohort studied different individual titles. All gained A* to C grades and scored very high in their section 4 NEAs. Section 1 helps them plan their study. Section 2 helps them write it up. This document has meant we’ve used no lesson time writing up the reports this year, it was all completed to a very high standard over the holidays, and handed in by October half term. Covers a few case studies of innovation and enterprise with some research activities to keep your students busy. 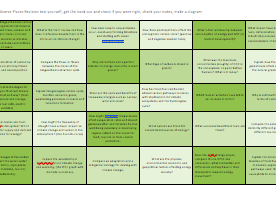 Either tackle one a day at home or use in class to bounce questions, my last group got 100% A*-C using these in revision lessons to pick a question for each other as a challenge. Presentation created from scratch to match the specification and activities in BTEC Book 2, as well as a set of cards to stimulate class discussion, sorting exercise and categorising activity. A worksheet to consolidate knowledge which can then be used to prepare the analysis/ merit elements of the final assignment for this unit. 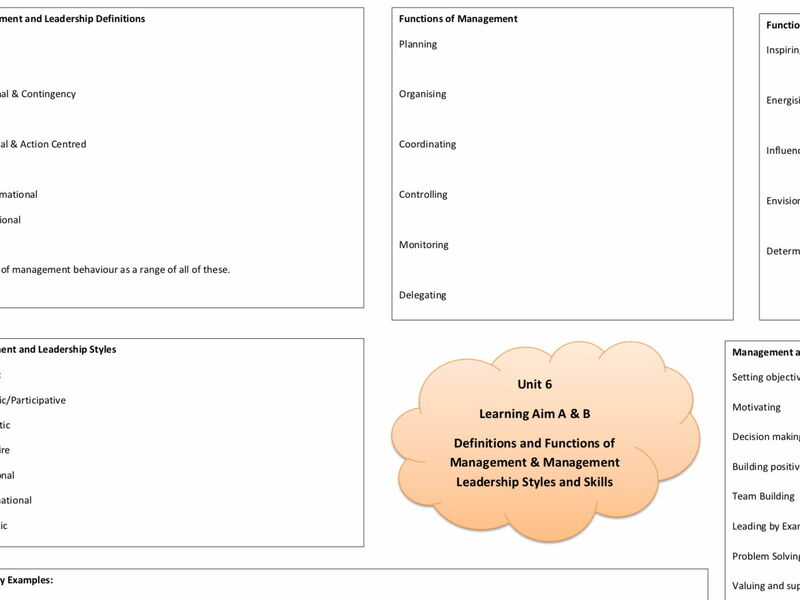 Use these A3 resources to help guide note consolidation, revision and planning for set tasks. I have found this useful with my weaker students who struggle to think up enough ‘points’ to explain in a 16 mark question. In particular those that seem hung up on concluding. ArcGISonline has a really helpful tool called Community Analyst that will allow you to produce outstanding secondary research on your study locations for your NEA. Requires an ArcGISonline education license This step by step activity will help you navigate the tools for the first time and enable you to make use of these incredible tools. Grab a full set of Unit 7 learning mats, tried and tested with this years new spec cohort, students love being able to consolidate their notes into one place. Works well for revision and planning how to approach the Part A of a set task. 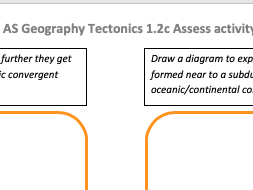 A step by step scaffolded tool for consolidating theory and encouraging students to apply the knowledge from block diagrams and theories of plate tectonics together and make arguments. First step is to draw the subduction zone benioff zone block diagram and annotate it. Then draw the subduction zone chain of volcanos scenario and annotate it Then make arguments about how well these two bits of scientific understanding support the differing plate tectonic theories. Final part is a gapped summary with assessment embedded to enable the weaker students to see how to build an argument. Worked well with year 1s today, showed up gaps in understanding around formation of volcanoes near ocean trenches. Questions from across the Pearson / Edexcel Spec for A Level Geog Superpowers. Use these at home for revision one a day style or in class and bounce the questions between students. My A* - C group really found these helpful, they show up gaps in knowledge, there is no hiding and each question turns into a group discussion, recalling case studies and detail. Get your students out on the high street studying their local retail area with this handy powerpoint and worksheet ready to be made suitable for your hometown. all the powerpoints, handouts and activities needed to deliver Unit 5 successfully. All original created from scratch using the specification, teaching case studies borrowed from A Level Geography (my other subject). Step by step through learning Aim A for Unit 4 Manage an Event, covering all aspects required in the spec in an active/discussion environment, with a matching task and A3 annotation for notes.